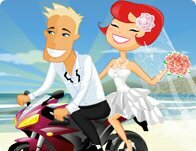 Description: Set sail for an outdoor wedding dipped in sunshine and sprinkled with love! Glowing gowns and cutting edge tuxedos are part of the action with this fabulous fashionable couple! 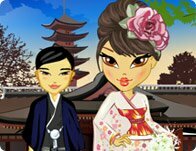 Instructions: Use your mouse to click on and through the floating clothing, hair, accessory, flower, and background options for both bride and groom. This traditional Japanese wedding is fantastic! The bride look gorgeous in her shiromuku and the elaborate ceremony is beyond remarkable.